Snow monkeys, like many species that live in groups, adhere to a system of social hierarchy. Rank among the troop is first established at birth. A newborn male will share his mother’s status until he grows old enough to leave the troop to venture off on his own, or, he will remain and ensure the troop’s protection. A young female will also share her mother’s status at birth. However, both genders have the opportunity to move up or down within the social structure. What other factors determine status, and how does it affect overall group survival? 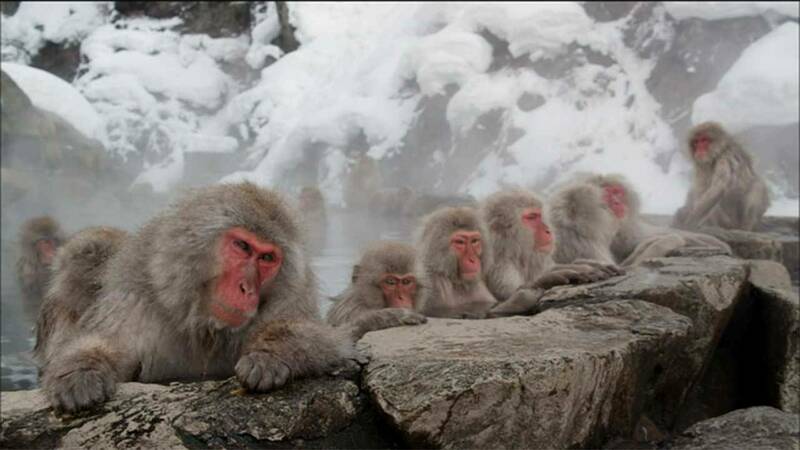 In this video from NATURE on PBS, a group of snow monkeys enjoys the hot springs of Hell Valley in Japan. The only member of the troop who doesn’t take a dip in the hot spring is Kuro-San, the troop leader. Help students examine why this may be in relation to the group hierarchy and Kuro-San’s place in the social system. Here are some Discussion Questions you can ask your students. What are ways in which status can be determined in a social hierarchy? Use evidence from the background essay in your response. What are the benefits of a social hierarchy? Use evidence from the video and background essay in your response. What are the drawbacks of a social hierarchy? Why are all members of the troop allowed access to the hot spring? Use evidence from the background essay to support your answer.